One of the key research skills is to evaluate sources, including Wikipedia, critically. Adding one reference to Wikipedia makes it a better tool. Any citation to a reliable source is a benefit to Wikipedia readers worldwide. Running from 15 January to 3 February, the #1Lib1Ref campaign is supported by Wikipedia Library and a number of Wikimedia Affiliates around the world. 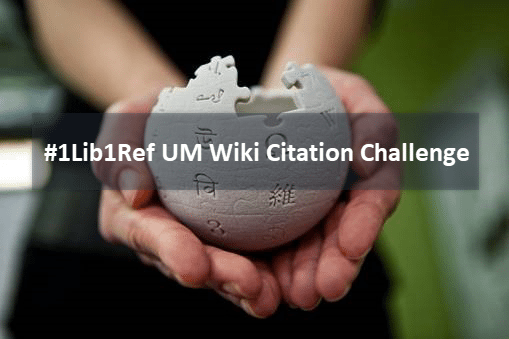 As part of the campaign, our University Library will host a Citation Challenge on Thursday 1 February from 13.00 – 15.00 in the Parlour at the Inner City Library (next to the information desk). In this workshop, a professional Wikipedia trainer will help you to use and add a reference to Wikipedia. Participating in Wikipedia Is easier when you can learn with others. And make a small contribution to the sum of all human knowledge! Limited spaces available so subscribe now! Because anyone can edit Wikipedia, the Wikipedia community has developed a core strategy to ensure the quality of information in its articles: including footnotes to reliable sources to allow Wikipedia readers to ‘verify’ the information. This strategy helps the global volunteer community effectively work towards meeting Wikipedia’s vision: creating ‘the sum of all human knowledge’. Readers and editors who don’t feel confident about a piece of information in an article can add a ‘citation needed’ tag next to that statement. These tags are similar to reference questions: members of the public asking for reliable research to back up the information they are reading. Thousands of articles need more references; 210,000 articles on English Wikipedia have no references at all. Imagine if everyone in the world took 15 minutes to address one of the citation needed queries, then Wikipedia would greatly reduce these gaps. Choose your topic to improve the information and support it with a proper reference. Like to start right away? Read all about the #1Lib1Ref campaign on The Wikipedia Library/1Lib1RefWatch and watch the video below about the campaign and how to add a reference to Wikipedia. Follow this What’s UB event on UM Library’s Facebook page . 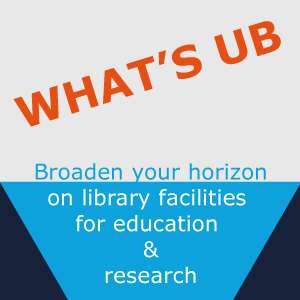 Join our ‘What’s UB’ events and let us inform and inspire you on new services, facilities and products.